Apparently I decided to take January off! Not to worry, I was still taking pictures! We kicked off the month with a fun Massini family get together at our house on Lisa’s last day in Florida. We had butternut squash soup, sandwiches, and a whole lot of fun! The next day, I put Charlie to work organizing the Christmas ornaments. This was heaven to him! At first, he was sad that we were putting them away. I explained that we have to put them away for them to be special again next year…Now every time we put something away, even for the night, he’ll say, “It’s gonna be special, Mama?” Pretty cute. The next weekend was Disney (Half) Marathon Weekend! By the way, I ran that. More on that later! Yes, those are our children outside Cinderella’s castle in the middle of the night. Yes, we are insane. Note that they are both wide awake. A few weeks ago, Margot was in her crib and Charlie was playing in her room while Nathan was spraying a diaper (glamorous). He kept hearing Charlie say “Her’s not on her’s bottom! Her’s not on her’s bottom!” over and over. He couldn’t really figure out what that meant, but thought that maybe she had fallen over. He walked in to find her pulled up on the side of the crib! Isn’t it funny that Charlie is noticing her milestones? In other news, Margot is eating (and loving!) Cheerios! There has been a whole lot of brother-sister love happening around here! I cannot get enough of those cheeks! Margot LOVES to stand. She’s always trying to get Nathan or me to help her up! Love that wild girl smile! Last week we had two parties in one day! We started off the morning with our play group and had a Milk and Bookies Christmas party. We all brought new books to donate to a local children’s home. 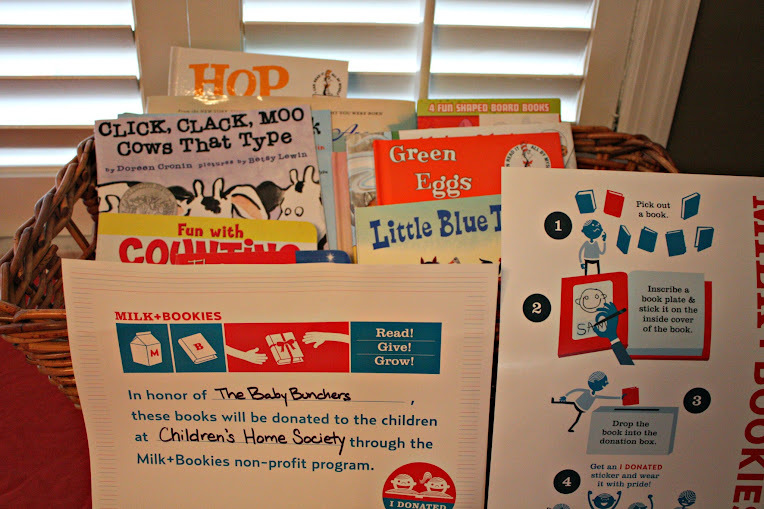 The Milk and Bookies organization provides bookplates, stickers, and helps you find an organization to donate to. 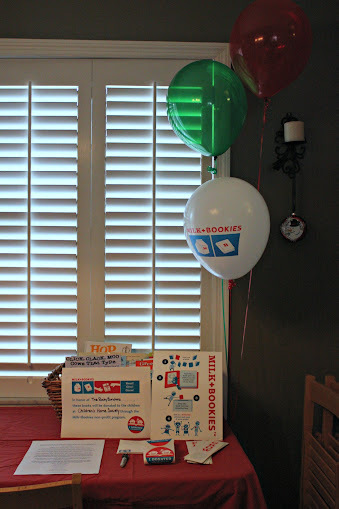 What a fun idea for children’s birthday parties, too! We gathered lots of books for the Children’s Home Society of Florida! The kids had so much fun decorating cookies. Charlie and Jack worked very hard on their masterpieces for about an hour, and then went back to decorate some more! I don’t think Jack’s cookie could handle any more decorating. The best hot chocolate ever! Jennifer made it from scratch with dark chocolate, complete with frozen cool whip star! It was seriously amazing. In fact, I could really go for some right now! I wish I got pictures of all the other fun foods and decorations. It was like Pinterest exploded in Jenn’s house, she and Liza really outdid themselves. Next, we hopped in the car to get to party number two, the EA Christmas party! It is so much fun every year. 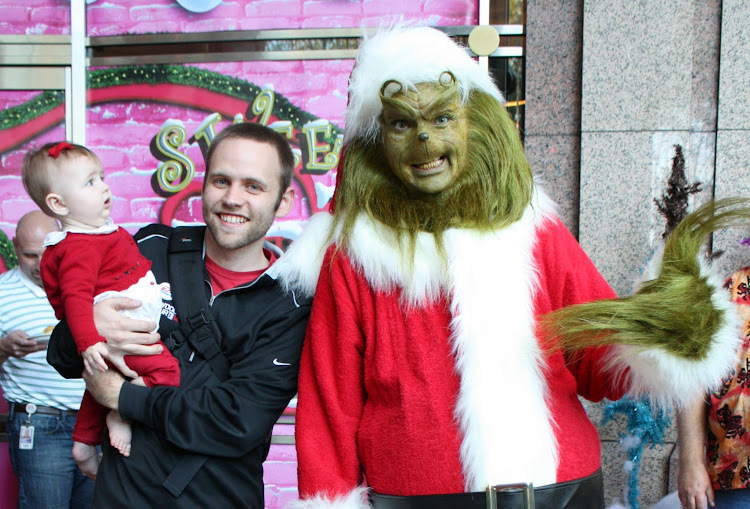 This year , the theme was “Who-liday,” the Dr. Seuss theme was everywhere, even the “real” Grinch! I’m guessing he came from Universal Studios, because that night we saw a commercial for their Christmas events, and there he was in the exact same costume and makeup! Margot was shocked to see him! We went to see Santa, too! The line was full of little white whimsy trees. Margot couldn’t even contain her excitement! We do not have a good track with Santa pictures. Check this one our from 2010. Surprise! 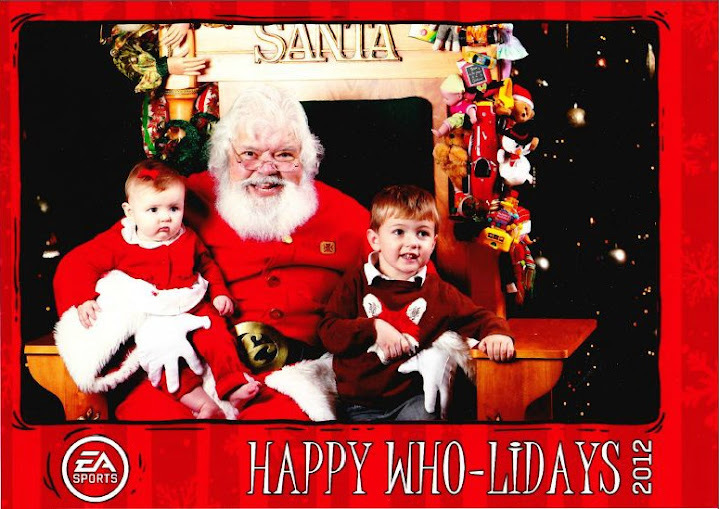 This year we have two happy kids sitting with Santa! The highlight of the party for Charlie was the snow. I’ve got to include this one from last year’s party. A live reindeer and Margot in the belly! What a fun day with family and friends! This week, I scrambled to make Margot’s Christmas stocking. We hung Charlie’s up last week after he kept going on about “sockings.” We’ve been reading The Night Before Christmas a lot around here! One day, I was folding a mountain of laundry on the couch. As I went to put some of it away, this is what I found. This was a really fast and easy stocking to make! Charlie’s took FOREVER. I vowed to myself that I would never ever make a stocking like that again because it was just too much work. His is very cute, though! Find the tutorial for his stocking at the Purl Bee here. Take a look at all the other fun Pinterest Christmas projects happening this week! Charlie and I decorated gingerbread boy cookies yesterday. Charlie wasn’t excited in the least. Just kidding! He worked very hard and probably ate about 3 times more chocolate chips than what he actually used. The finished, goopy cookie. Looks great, Charlie! Does it taste good? Margot had fun too, even if she had no idea of what was going on!